Kenya maps from Omnimap, the leading international map store with 275,000 map titles. Kenya Travel Map. 1:950,000. ITMB. Detailed road map with shaded relief and color tinting to show elevation. With a small inset map of central Nairobi. Double-sided map. $12.95 64-88901 1 sheet, folded. Kenya Travel Maps. 1:1,040,000. National Geographic Maps. The front side of the Kenya map details the southern region of the country, from The Indian Ocean to the east, to the bordering country of Tanzania to the southwest. The reverse side of the map details the northern region, showing the bordering country of Ethiopia to the north, Somalia to the east, and Uganda to the west. Map size is 26 x 38" when unfolded. $11.95 64-88905 1 sheet, folded. Touring Map of Kenya. 1:1,500,000. Tourist Maps Kenya. This map highlights the national parks of Kenya, although it is less detailed than 64-88909 above. The main map shows roads, national parks and reserves, lodges, camps, places of interest and much more. 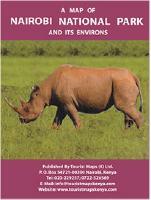 The reverse side has small maps and descriptions of the twelve most popular national parks/reserves in Kenya. $26.99 64-88907 1 sheet, folded. Tea Map of Kenya. 1:1,200,000. Tourist Maps Kenya, for the Tea Board of Kenya, 2003. The main map highlights the tea-growing regions of Kenya. It uses color-tinted relief to show elevation. It also includes inset maps of the main regions; the eastern slopes of Mt. Kenya and the Aberdare Ranges, and the area west of the Rift Valley. The maps locate and name the numerous tea estate factories, smallholder tead factories, tea research stations, nyayo tea zones, and much more. Illustrated with several photographs of tea plants, processing tea leaves, etc. $16.95 64-8860 1 sheet, folded. Tourist Map of Kenya Coast, including Mombasa Island. 1:1,500,000. Tourist Maps Kenya. This map highlights the coastal area of Kenya. The map includes detailed inset maps of Malindi and Mombasa Island (1:16,875). The map shows parks and reserves near the coast, special sites such as historic ruins, hotels/lodges/camps, airstrips, four levels of roads, and much more. $21.99 64-8878 1 sheet, folded. Kenya Municipality Topographic-Cadastral Maps. 1:10,000. Kenya Survey. 1981-1982. $59.95 64-8893E Eldoret Municipality topographic-cadastral map. 1:10,000. 1981-1982. 4 sheets. $34.95 64-8893J Isiolo Municipality topographic-cadastral map. 1:10,000. 1981. 2 sheets. $59.95 64-8893K Kericho Municipality topographic-cadastral map. 1:10,000. 1982. 4 sheets. $19.95 64-8893P Nyahururu Municipality topographic-cadastral map. 1:10,000. 1982. 1 sheet. Kenya Topographic Quadrangle Maps. 1:50,000. DOS Britain & Kenya Survey. There are about 400 quads available for Kenya. Please see the index map for the available quads. The blue and red numbers are the year of publication for that quad. The blue numbers indicate topographic maps with contour lines; the red numbers indicate planimetric quads. For ordering individual sheets or digital quads, please look at the index to figure out which sheet(s) you need and then order them using the "Each, specify area" order button below. On the order form, specify the sheet number in the "Comments" section. The 1:50,000 series was never completed, so not all sheets are available. NOTE: The index map is a combination 1:100,000 and 1:50,000 index. The number in the center of four small squares is the 1:100,000 sheet number. To specify the 1:50,000 sheet number, use the large number and then NW, NE, SW, SE, such as 181-SW.
Map of Amboseli National Park. 1:50,000. Kenya Wildlife Service and Tourist Maps Kenya. Based on the Kenya Survey map, this map adds descriptive text with contact information, campsites, etc. Amboseli is the second most popular park in Kenya after Masai Mara, mainly because of the spectacular backdrop of Africa's highest peak, Mt. Kilimanjaro, which broods over the southern boundary of the park. Amboseli can turn into a real dust bowl in the dry season. Buffaloes, lions, gazelles, cheetahs, wildebeests, elephants, hyenas, jackals, warthogs, zebras, masai giraffes, and baboons are all present. Large elephants herds can be seen grazing with the Mt. Kilimanjaro in the background. $16.95 64-8887AM 1 sheet, folded. Gombe Stream National Park Map. 1:50,000. Kenya Survey, 1978. This is sheet 92/1 of the national 1:50,000 series which completely covers the national park. $19.95 64-8888G 1 sheet, flat. Map of Mt. Elgon National Park. 1:35,000. Kenya Wildlife Service and Tourist Maps Kenya. A detailed hiking map of Mt. Elgon, with color-shading to show elevation, spot heights, symbols to show lodges, camp sites, and much more. Some descriptive text along the margins. The Park lies on Kenya's second highest mountain, at an altitude of between 8000 and 13800 ft above sea level. Mt. Elgon is an ancient eroded volcano with a huge caldera and on its summit, a spectacular flat topped basalt column known as Koitobos. Another unique feature is the lava tube cave measuring over 60m wide and frequently visited by elephants in search of salt licks. Besides a rich heritage of fauna and flora, the Park is also endowed with a variety of breathtaking scenery cliffs, caves, waterfalls, gorges, calderas, hot springs and the mountain peaks. $14.95 64-8887ME 1 sheet, folded. Mt. Elgon Hiking Map, Kenya/Uganda. 1:50,000; 1:125,000; and 1:500,000. West Col, Britain. Excellent map of this popular tourist spot, with trekker information on the reverse. Mt. Kenya Hiking Map. 1:25,000; 1:50,000; and 1:400,000. West Col, Britain. Excellent map of this popular tourist spot, with trekker information on the reverse. Map of Nairobi National Park and its Environs. 1:50,000. Kenya Wildlife Service and Tourist Maps Kenya. A map of this national park just south of Nairobi and bordering Kenyatta International Airport. Includes small sketches of the common animals in the park - zebras to civets and many more. 200 meter contours. $19.99 64-8887NA 1 sheet, folded. Map of Tsavo West National Park. 1:300,000. Tourist Maps Kenya, 2011. A detailed map, for the scale, of Tsavo West National Park, with color-shading to show elevation, numerous spot heights, symbols to show lodges, camp sites, bandas, water holes and boreholes, ranger posts and much more. Some descriptive text and sketches of common animals along the margins. This Park covers a huge variety of landscapes, from swamps and natural springs to rocky peaks, extinct volcanic cones and rolling plains. Wildlife is difficult to spot because of the dense scrub. Birds are common and there are large populations of elephants, zebras, hippos and leopards. Lions are out there, but they tend to stay hidden. 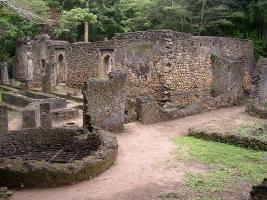 The focus is Mzima springs, which produces 93 gallons of fresh water a day. There's an underwater viewing chamber. Another attraction is the Ngulia Rhino Sanctuary, at the base of Ngulia Hills, part of Rhino Ark program. $19.99 64-8887TW 1 sheet, folded. $3.99 67-1070KEN Kenya. Size 4 x 6 in. $64.95 67-1073KEN Kenya. Size 2 x 3 ft.